The image to the left should be recognizable by most of us as the American alphabet. It is from these 26 letters that billions of people are able to communicate on a daily basis. We learn the alphabet early on with rhymes and rote memorization so that we may contribute to society through our interactions. 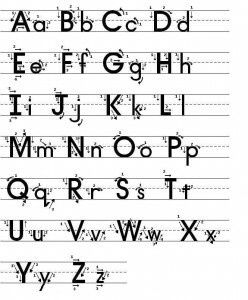 We all progress at different speeds, but eventually we all get to the point where we can recognize all the letters in the alphabet. It is at that point that we build upon that foundation and begin to spell words like C-A-T and T-R-E-E. These words are then combined to form sentences which consist of several words. From those sentences we form paragraphs and so on until we are able to write and communicate with others through pattern recognition. This ability of pattern recognition isn’t anything new or even earth shattering–it’s common sense. Just like the alphabet, which is in a pattern, we can discern the different patterns in lots of things. Take a look at the image below and you can recognize a pattern as well where there are higher highs and higher lows. Unlike the alphabet and some other patterns that have a beginning and an end, some patterns are continuous. Such would be the case for a chart that shows price action in a publicly traded company. We could begin to see patterns in the line above and learn to predict or assume what has the higher probability of occurring next. As an example, looking at this pattern above we might safely assume that the odds are greater that the line will move lower from here as it has in the past. This does not necessarily mean that it will, but the odds are in the favor of such a move. It is this assumptive process that will serve not as an ends, but more of a means to and end. This pattern recognition assumes that the next move would be lower and thus helps us to proceed further. Information that we’ve gathered from the past can help us predict what the future may hold and this is the basic tenet of technical analysis. Technical analysis can even be performed on your own trading account and patterns begin to emerge where you can recognize when your trading is “on” as your account grows and when the dollar amount pulls back you can assume that your trading is “off.” This ability to recognize the patterns as your account fluctuates in price is a decent beginning, but nowhere near the wealth of information that can be gleaned from your trading history. Trading journals are one of the most underused indicators that every trader has at their disposal. Why is it that such a powerful indicator is underused? I’d venture a guess that a majority of traders don’t keep a trading journal because of the time it takes to keep one. I could be wrong, but over the years as I’ve mentored traders from all walks of life, time was the number one reason for failure. Second on the list was not knowing what a trading journal was so after reading this article, you now have no excuses as to why you don’t keep a trading journal. Below is a list of what I’d recommend to have in a trading journal and, as with anything in life, you’ll get out of the journal what you put into it. If you are able, ATTACH CHARTS TO ALL ENTRIES! Remember the pattern recognition? Something may not have stood out in the heat of the moment, but several weeks later you may see similar chart patterns to this one. It is at that time that you begin to find common threads and themes of your trading which will allow you to exploit those things you do well and avoid those things you do poorly. Why did you allocate what you did to each trade? Did it meet all of your criteria? Why did you trail the stop where you did? Why did you exit when you did? How is your percentage reliability of trades over time? Does it fluctuate? If so, why? What do you think about each trade as you make it? Are you most nervous about your best trades? Does your gut tell you anything consistently? Which trades worked the best and worst? Were there any common elements of your trades? Are there blocks you notice that cloud your objectivity? Are you making the types of returns that were your goal in terms of risk/reward? If you take the time to address questions like these then patterns will begin to emerge and you begin to understand yourself and your individual trading style. As I’ve said before, you need to treat trading as a business as doing so helps you control your emotions. It is impossible to not be emotional when trading but it is possible to control your emotions. The last suggestion I would have is that you simply open up a blog and use that as your trading journal. There are several free services out there that allow you to create a blog and upload images, etc. The neatest thing about using a blog for your trading journal is the search function as each post or entry you make allows the use of tags or keywords. As an example, for every trade you make that is bullish, put the keyword bullish as a tag and later you’ll be able to search for that keyword. With a few clicks of the mouse you can see every entry that you ever made in your trading journal that has the tag bullish in it. Take a few moments and read through them and start recognizing patterns. Write as often as you can in your trading journal and get into the habit of writing in it on a daily basis. When you close a trade, income or expense, take the time to capture your emotions at that point. A good idea is to come back and revisit your journal entries on a quarterly basis and add to them as you are now emotionally removed from them. 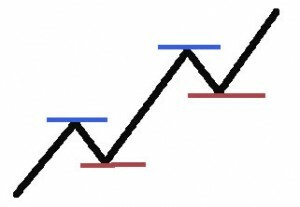 You might even begin to sense a change in emotion as you read your prior entries…run with that and profit from recognizing your patterns.